It's possible that at some point in the next year or two (OK, maybe three) I'll add a Neo Geo CD--the top-loader depicted in the photo below, specifically--to my ever-growing console collection. I know, that admission in and of itself is enough to warrant another "here's why I'm an eccentric gamer" post, but in this case that's just the start of it. The rest of it: I really only want to be able to play two games--Puzzle Bobble and Twinkle Star Sprites--on this (possible) future acquisition. Oh, I wouldn't be surprised if, at some point, I were to be tempted to pick up a few additional games for the system--like Super Baseball 2020 (seemingly strange choice for me, I know) and Blue's Journey/Raguy--but the two mentioned in the previous sentence would be the main reason behind this particular spending spree. Anyway, of all the desires and dreams detailed in these "reasons I could be considered an 'eccentric' (aka bat-sh*t crazy) gamer" posts, this one is, by far, the least likely to become a reality. Still, I think the fact that I'm even thinking of buying a Neo Geo CD is worth mentioning here. Yes, it's most definitely a sickness, Justin. Thankfully I'm able to show at least some restraint when it comes to buy (or not buying) all of these desired games and systems, right? Do you have an AES, Kimimi? If so ... wow! I'd say I want an AES rather than a Neo Geo CD, but AES games are still pretty darn expensive. The CD ones seem a lot cheaper. Anyway, thanks for pointing me to Windjammers. I feel like I've heard of it, but I can't remember the point of it at the moment. Off to YouTube! I think I'd go for a NGCD next time - the games are far more affordable and unless you're looking playing a lot of beat 'em ups the loading times aren't as bad as people make them out to be. Yeah, I hear what you're saying, Kimimi -- RE: the prices of most AES carts. 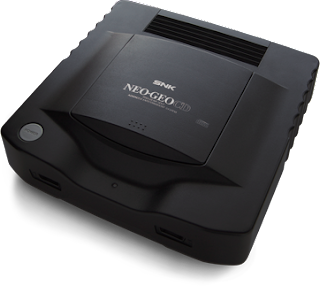 If I ever were to pick up some sort of Neo Geo system, it'd definitely be the CD one, as I'm not much of a fighter fan. As long as I could play Puzzle Bobble and Twinkle Star Sprites, I'd be happy. Anyway, do you think you'll ever actually pick up a NGCD yourself? Or has that ship sailed? Super Baseball 2020 is awesome, btw. I only played the SNES import, but it was one of a handful of games that me and my dad enjoyed together. Also, two words: Top Hunter. Oh, I love that story, Ash! I don't suppose you ever got one then? Obscure games played on obscure systems: there is no finer way for a true retro afficionado to display their excellent sense of taste! I`ve never played the NEO GEO CD, but wish you luck in your quest to one day own one! loading - title screen - loading - character select - loading - prefight taunts - loading - actual fight. Each of those loads can be anything from 30-60 seconds long. It gets really annoying. The best thing about Neo Geo games is how great they are to pick up and play but the load times kill them. Games like Metal Slug even have load times in the middle of stages. You are better off getting an MVS board and hooking it up to a supergun. The MVS carts are cheaper and easier to find. I'm planning on doing it myself whenever I get a job ( :( ) and doing it as a project. Yeah, I've heard about the loading times, Retr0gamer. Thanks for underlining how horrible they actually can be, though. Really, it's unlikely I'll ever get a Neo Geo AES, Neo Geo CD or a supergun/MVS. In a perfect world, I would all one or all of them; in this one, I'll likely be happy with my current haul of systems plus a few more oldies (like a Mega Drive, Super Fami and mayyyyyybe a Saturn). Can't recommend a saturn highly enough. Western line up is a bit crap but discovering all the great games that were released in japan is one of my fondest gaming moments.